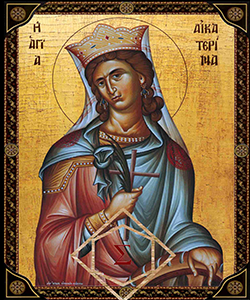 An artist's depiction of the icon of Saint Catherine. Containment Protocols: When not in use, RPC-146 is to be sealed in a high-value item container in Sector █ of Site-004. Inspection of the image is to be done on a bi-weekly basis for deterioration due to oxidation. Maintenance must be facilitated with the use of candlelight and digital facially mounted binocular display, with all footage archived for RPC-146 maintenance report reference. During testing periods, RPC-146 is to be kept in a high-security Alpha Class containment chamber at Sector █ of Site-004. The room is to be decorated with a mock-up of an Eastern Orthodox Christian monastery with a darkened airlock. RPC-146 is to be displayed upon a wooden podium at the front of the room and should be visible when entering. The room is to be lit by gas wall lamps with candles as supplemental lighting. Following Incident 146-001, all personnel with little to no-religious beliefs must wear respiratory protective gear in order to not inhale the ejected lead fumes of RPC-146. If personnel with little to no-religious beliefs are exposed to RPC-146 with no respiratory protection gear, they must be directed to Medical Sector ███ for immediate lead poisoning testing. Site-004 personnel are permitted to view RPC-146 after all artificial lights sources, including equipment with illuminated indicators, have been deposited at security station alpha. Description: RPC-146 is an old Greek Orthodox Icon of Saint Catherine, measuring in 30x40x120 cm. The colors used in the icon have been found to be lead-based while a very light finish has been put to enhance the colors. The image has been painted upon a plank of smoothed out olive tree wood. RPC-146 was found in a small abandoned monastery in ██████, Greece by a small group of tourists that had gone hiking around the island of ███████ after they reported it to a local tourist agency guide. Initial responses of the tourists had been mixed with two claiming the image being in extremely bad shape and of bad artistic quality, showing a very crude image of Saint Catherine while one claimed the image being of high quality, with the wood and painting being in pristine condition. Later investigations showed that the two individuals that described the quality of the image as poor and crude possessed little to no investment in a religion, while the individual that described the quality of the image as high and pristine was a highly devout Eastern Orthodox Christian. The anomalous properties of RPC-146 have been found to alter the image of Saint Catherine to anyone that looks at it depending on their religious standing or beliefs. The quality of the image can range greatly from extremely crude to pristine. Atheist or Non-Religious personnel have been noted to see the image in terrible or highly deteriorated quality, Semi-religious personnel have been noted to see the image in good and clear quality with light deterioration and Highly Religious personnel have been noted to see the image in pristine quality. When a photograph, photocopy or artistic rendition of RPC-146 is made, the copy has none of the anomalous properties of RPC-146, appearing as it would seem to semi-religious personnel. Outside of a church environment, RPC-146 loses its anomalous properties and forms of artificial light have been found to cause its paint to slowly deteriorate. After Incident 146-001, RPC-146 has been found to cause cases of lead poisoning in personnel with little to no-religious beliefs. Further investigations have found that when personnel with little to no-religious beliefs view RPC-146, the image eject fumes of lead into the atmosphere caused by the corrosion of the lead-based paint used on RPC-146. No casualties have been noted of yet due to exposure to RPC-146. Testing with religious personnel has proved to not cause RPC-146 to eject fumes of lead into the atmosphere. In the following experiments, Observers with different religious stances were put inside the containment room of RPC-146 in order to view its anomalous properties and were tasked with describing RPC-146 as they saw it on the items of what the image showed, the quality and decay of the image (if there was any) and its overall condition. Description of RPC-146 by Observer: "A rotting religious image that can turn to dust any minute now. The saint in the image is too crudely drawn and too bad of a state to understand who it is supposed to represent." Description of RPC-146 by Observer: "A nice image although lacking when it comes to details. The colors are dim with not much life in them and the wooden base seems to need some reworking." Description of RPC-146 by Observer: "A somewhat alright image of a Christian saint. Not much to it, pretty bland and kinda deteriorated. Lacks details." Description of RPC-146 by Observer: "A true work of art. The image of the saint represents her in her true holy glory with every detail and line having been drawn perfectly. The colors of the image are bright and lively and the wood in perfect condition." After extensive testing with Dr.█████ on RPC-146 during Experiment #1 under Experiment Log 291, Dr.█████ noted having strong headaches after three days from being exposed to RPC-146 to Medical Dr.██████████. Diagnosis of Medical Dr.██████████ failed to show a clear cause. Aspirin was prescribed to Dr.█████ to combat the headaches. With the passage of two days Dr.█████, was found having attention and memory problems while working in his laboratory in Sector ███ by his assistant, Dr.██████. After being directed to Medical Dr.██████████ and undergoing blood testing, high levels of lead were found in his bloodstream, thus causing Dr.█████ to suffer from Lead Poisoning. Treatment was administered Medical Dr.██████████ and Dr.█████ was put out of commission until fully recovered.